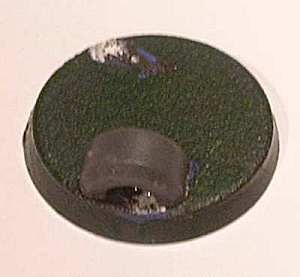 This article intends to expand upon the idea of basic basing on minis by making use of a mixture of materials and bits box odments. As an example, lets say that a base is graded on a scale of A (highest) to E (lowest). If a neatly flocked base gets you a C, this article intents to help you get a C+. Maybe even a B . First up, materials. 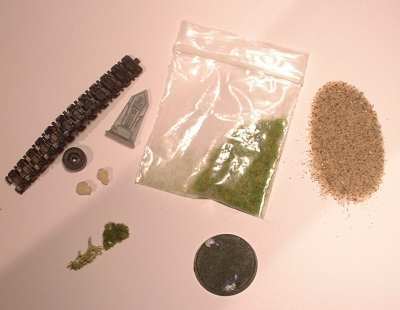 Below is a picture of some of the most common things I use in bases. Top row is a selection iof items from my bits box; skulls, a tombstone, some tank tracks and a tank wheel. Next, some static grass, one of the most common materials used, and in my opinion the best, to represent grass. Next to that is some sand. This stuff I have in abundant supply, living within a stones throw of a beach! On the bottom row, we have sopme lichen, great in representing low lying shrubs and available in various shades and colours. And last but not least, we have the base itself. On the subject of useful bits, there are sooooo many different tings you can use just to add that little extra something. Tombstones are one of my favourites, as are individual tank track sections, but you could use skeletal arms, legs, whole torsos, weapons, washers, electircal flex (preferably NOT attached to a live socket ), cork boulders, well you get the idea. Even a small chunk of sprue can be painted up as an interesting piece of scrap. 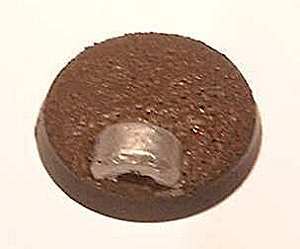 In my example i'll be using half of the tank wheel, and creating a dried earth and grass base. So.... onto the next page. First up, carefully cut off a section of the wheel. 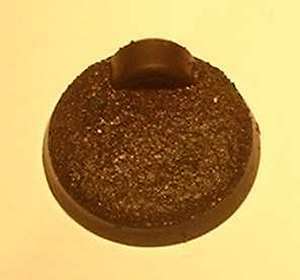 If your using some other item, remember to file it flat on the surface that you will attach to the base. This will help the object look slightly buried under the earth rather that sitting inconspiculously on top. 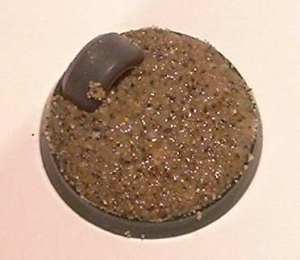 Next, cover the remaining area of the base in a thin layer of PVA glue, and dip it into or sprinkle sand on top. I usually wait about 30 seconds to allow the glue to seep through gaps in the sand, which seems to help make a tighter bond, before shaking off any excess. Incidentally, if you use a thick layer of glue, you can end up with a more compact appearance to the final base. Once the glue is dry (have a cup of tea, or a beer), give the whole base a covering of your preferred primer. This not only assists in helping paint bond, but helps to seal the base as well. 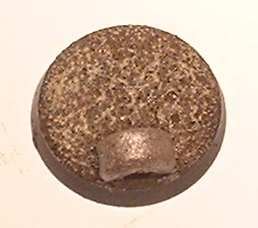 Painting the base is a very quick and simple process of drubushing and stippling. Paint the layer of sand with a dark brown (GW Scorched Brown in this instance) and the piece of scrap in an appropiate colour, in my case, silver. Next, i added GW Desert Yellow to the Scorched Brown and drybrushed the sand with 2 or 3 lighter tones, followed by a very light drybrush of pure Desert Yellow. I then used the stipple technique (similar to drubrushing except that you jab at the area rather than drag the brush across the area) to add rust and dull down the metallic area. 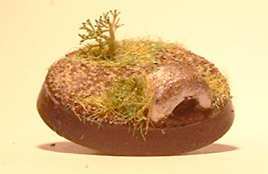 And finaly, using PVA glue add some small patches of static grass and lichen to the base. Remember to only use very small pieces of lichen, and think about where the mini's feet and other extremities such as cloaks will be before you glue anything on. There you have it! Simple steps to achieving a C+-maybe-even-a-B base! 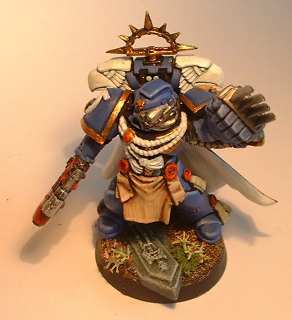 This last example is one from my gallery, an Ultramarine Commander, standing on a tombstone. Ill finish with a quick apology for the quality of the pics, I will improve on these as soon as possible. Happy Painting!